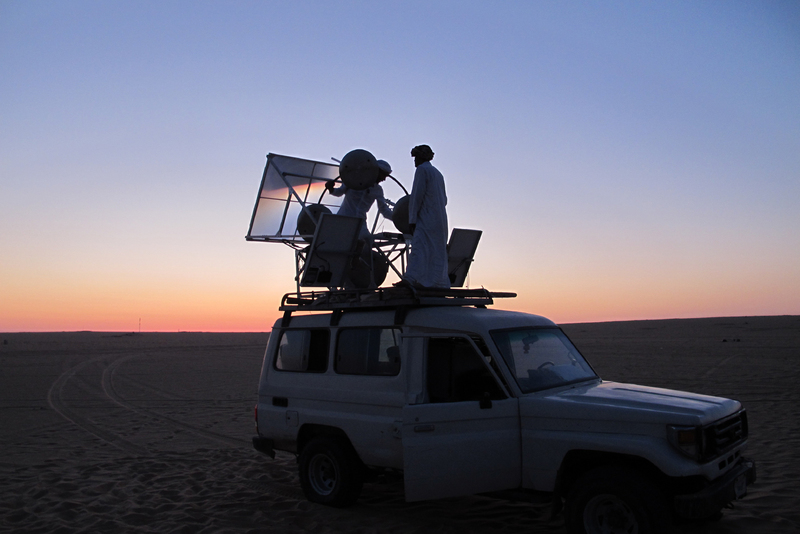 In August 2010 I took my first solar machine – the Sun-Cutter – to the Egyptian desert in a suitcase. This was a solar-powered, semi-automated low-tech laser cutter, that used the power of the sun to drive it and directly harnessed its rays through a glass ball lens to ‘laser’ cut 2D components using a cam-guided system. The Sun-Cutter produced components in thin plywood with an aesthetic quality that was a curious hybrid of machine-made and “nature craft” due to the crudeness of its mechanism and cutting beam optics, alongside variations in solar intensity due to weather fluctuations. 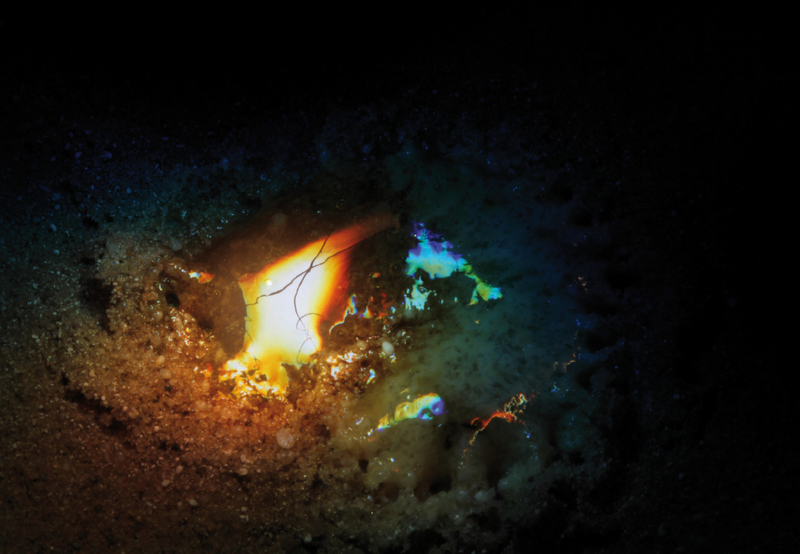 In the deserts of the world two elements dominate – sun and sand. The former offers a vast energy source of huge potential, the latter an almost unlimited supply of silica in the form of quartz. 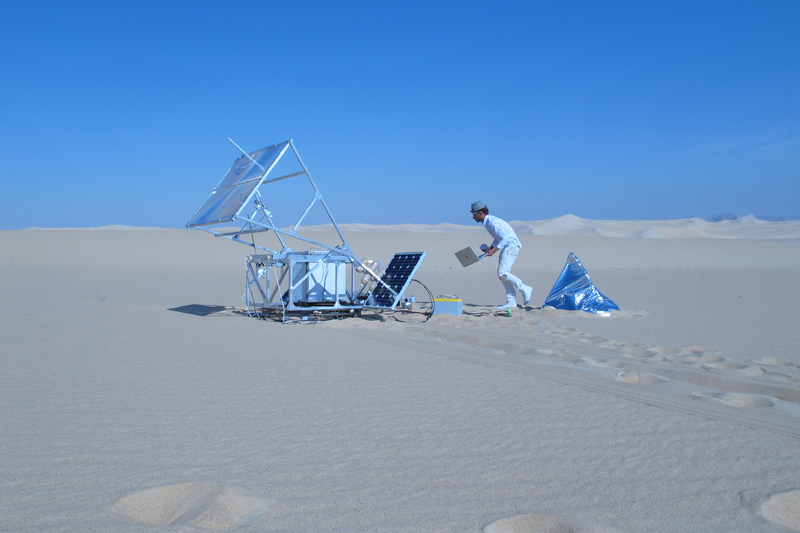 The experience of working in the desert with the Sun-Cutter led me directly to the idea of a new machine that could bring together these two elements. 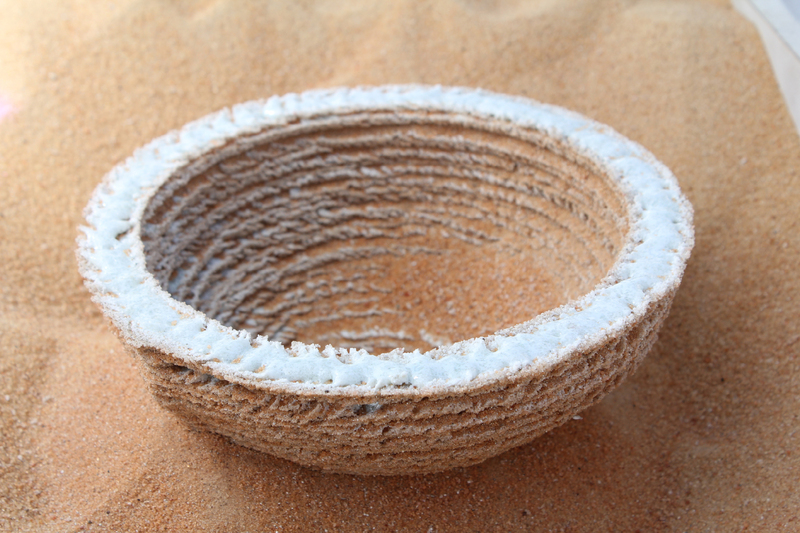 Silicia sand when heated to melting point and allowed to cool solidifies as glass. 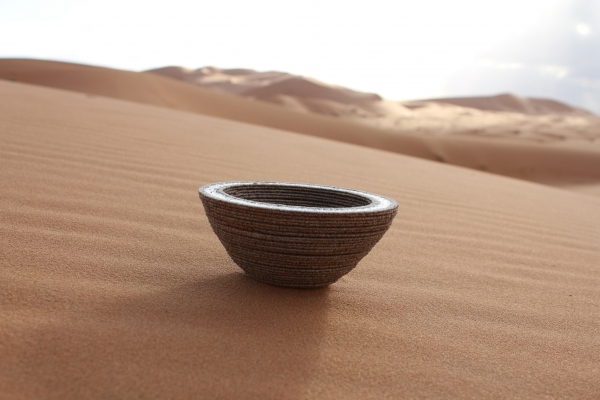 This process of converting a powdery substance via a heating process into a solid form is known as sintering and has in recent years become a central process in design prototyping known as 3D printing or SLS (selective laser sintering). 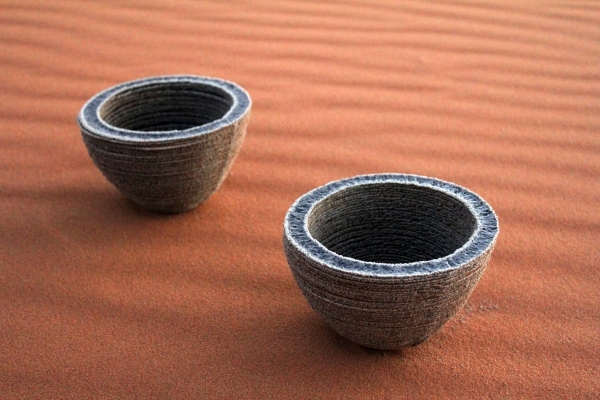 These 3D printers use laser technology to create very precise 3D objects from a variety of powdered plastics, resins and metals – the objects being the exact physical counterparts of the computer-drawn 3D designs inputted by the designer. 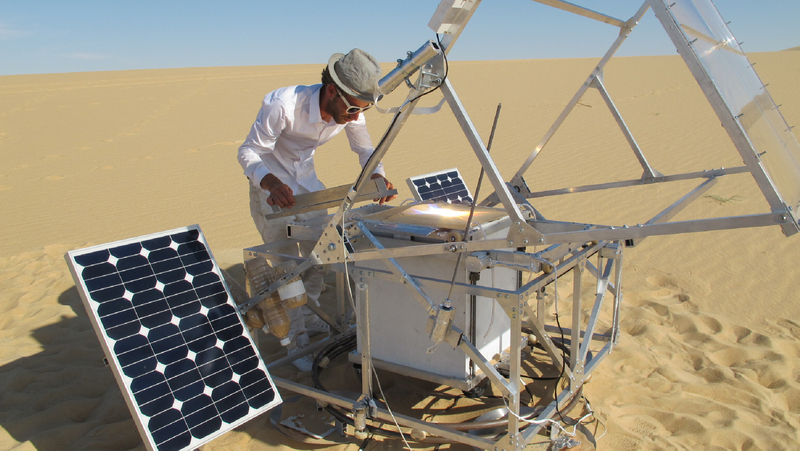 By using the sun’s rays instead of a laser and sand instead of resins, I had the basis of an entirely new solar-powered machine and production process for making glass objects that taps into the abundant supplies of sun and sand to be found in the deserts of the world. 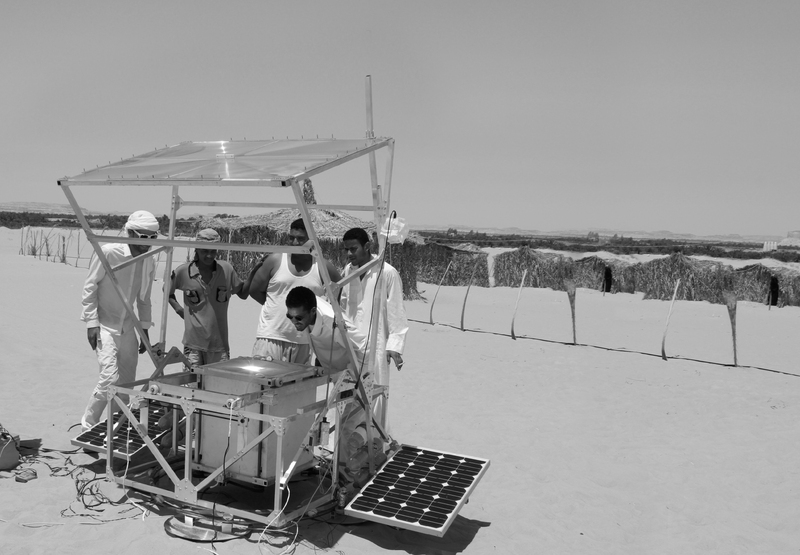 My first manually-operated solar-sintering machine was tested in February 2011 in the Moroccan desert with encouraging results that led to the development of the current larger and fully-automated computer driven version – the Solar-Sinter. 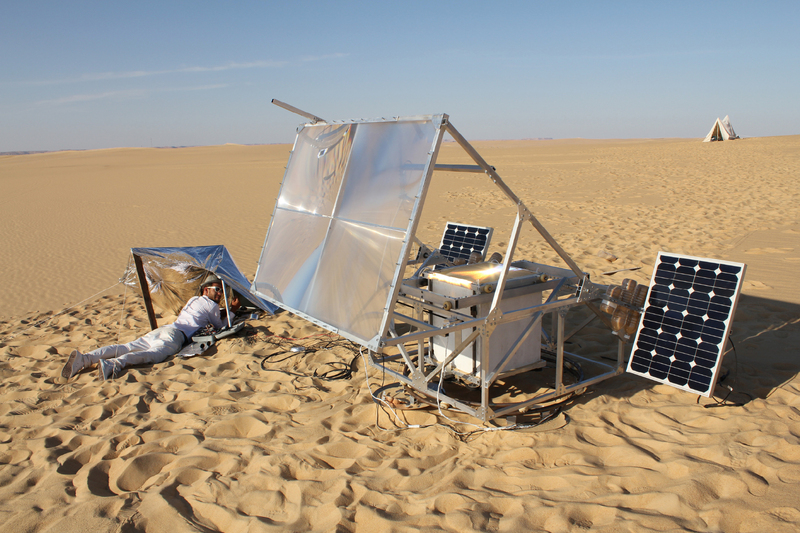 The Solar-Sinter was completed in mid-May and later that month I took this experimental machine to the Sahara desert near Siwa, Egypt, for a two week testing period. The machine and the results of these first experiments presented here represent the initial significant steps towards what I envisage as a new solar-powered production tool of great potential.